Add services to deals in the sales or budget phase. Use different pricing models to setup a fixed price or time and materials proposal. Services are type of things you do for your clients. Also, what's very important is that people will track time against them. or anything else that's applicable to your organization. You can manage service types in Settings. Click on Add services button to add your first service to the deal. 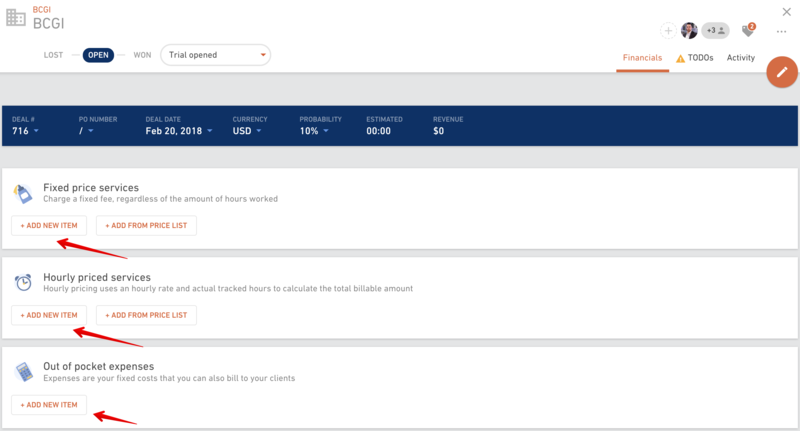 You can add more services by clicking on the Edit financials button. 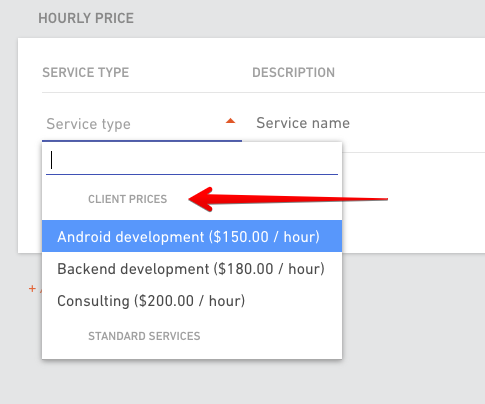 Hourly pricing - put down an hourly rate, and the total price will be dependent on the amount of hours actually tracked. You can also include an estimate of how many hours you think it will take. Fixed price - you'll need to put down a fixed price for the service. You can also include an estimate of how many hours you think it will take. 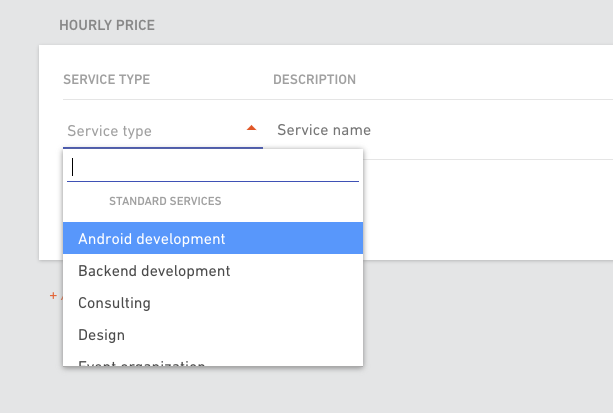 If you already added service types in the Settings pick one from the drop down menu. 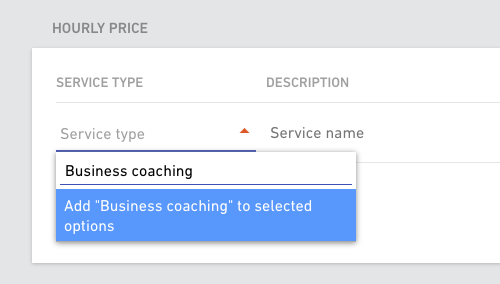 If not, just start typing the name of the service you want to add and hit the Add to selected options link. If you have custom price lists set up for this client, these prices will show up in the dropdown menu first. Next thing you need to do is put down some numbers. If you're adding hourly services, you'll put down Estimated hours and Rate. If you're adding fixed price services, you'll put down some more information like Unit, Quantity and Price. Add more services by hitting the Add new item. 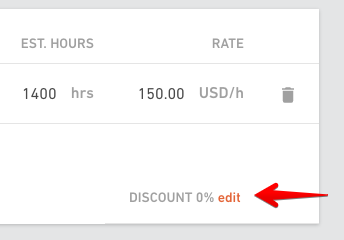 If you want to add discount to your services, look for an Edit link next to a discount. Let’s say you have a deal with both hourly and fixed price services. For example, you’re doing project management hourly, but also selling licences for a fixed price per unit. You can add both types of services to your deal. Click on the Add new item under fixed price services or hourly priced services. You'll be able to mix this up to create any kind of deal you want. Need to change something? 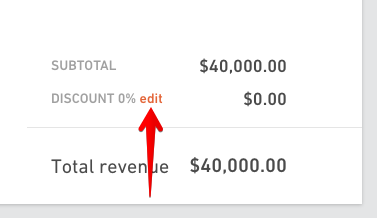 Click on the Edit financials button, make changes you need and hit Save changes button in the bottom. If you want to delete the service, this is where you will find a Delete button as well.